ICE agents arrest alleged victim of domestic violence. U.S. Immigration and Customs Enforcement agents detain an immigrant on Oct. 14, 2015, in Los Angeles. 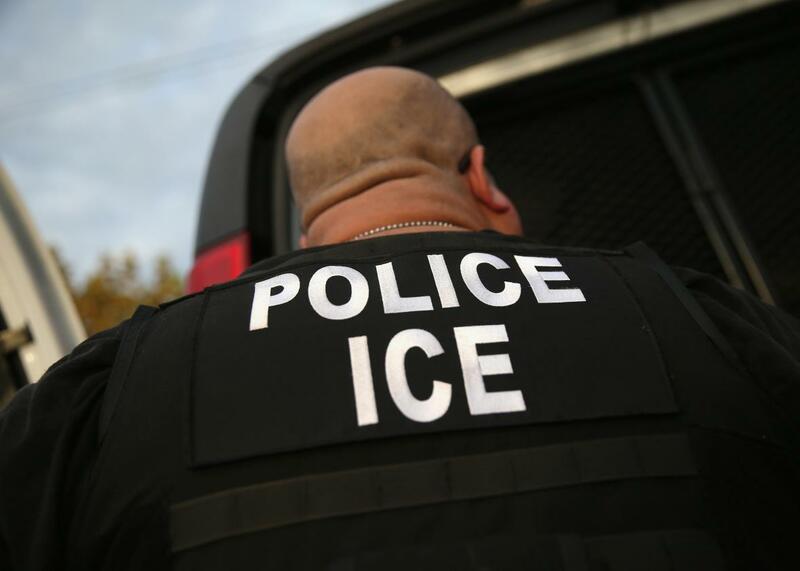 Immigration and Customs Enforcement agents arrested an undocumented woman who alleges she was the victim of domestic violence, the El Paso Times reported on Wednesday. The agents were likely acting on a tip from the woman’s abuser, whom ICE had taken into custody earlier, according to El Paso County Attorney Jo Anne Bernal. In 2016, the woman contacted the police three times alleging that her partner had chased her with a knife in addition to punching, kicking, and choking her. CBS4 in El Paso, Texas, reports that the woman, who is transgender, was living at a shelter for domestic violence victims. She attended court last week to obtain a protective order against her alleged abuser. On a Thursday press call, Bernal said that an ICE agent sat through the proceedings while two agents stood by the doors to the courtroom. After the judge issued the protective order, Bernal said, the victim’s attorney escorted her into a jury room to speak privately for a few minutes. When the abuse victim exited the jury room, two federal agents approached her, escorted her out of the courthouse, and placed her in federal custody. She now faces deportation proceedings. Eyewitnesses—including attorneys from Bernal’s office, the judge who granted her protective order, and the advocate representing her—confirm this account. An ICE affidavit, however, alleges that agents didn’t speak to the woman inside the courthouse but rather first made contact with her outside the building. Bernal believes that the agents were likely acting on a tip from the woman’s alleged abuser, who is currently in jail. She noted that such arrests make undocumented victims less likely to report their abuse. Indeed, her office does not ask about citizenship status for that very reason. Bernal told CBS4 that the problem goes beyond domestic violence. Judge Yahara Lisa Gutierrez, who oversees the court that granted the victim’s protective order, agreed. Gutierrez told the El Paso Times that abusers commonly attempt to control undocumented partners by threatening to report them to ICE. She said that ICE agents should resist helping domestic abusers by refusing to act on tips they may give about their partners. On Thursday, Bernal reiterated the unprecedented nature of the arrest.